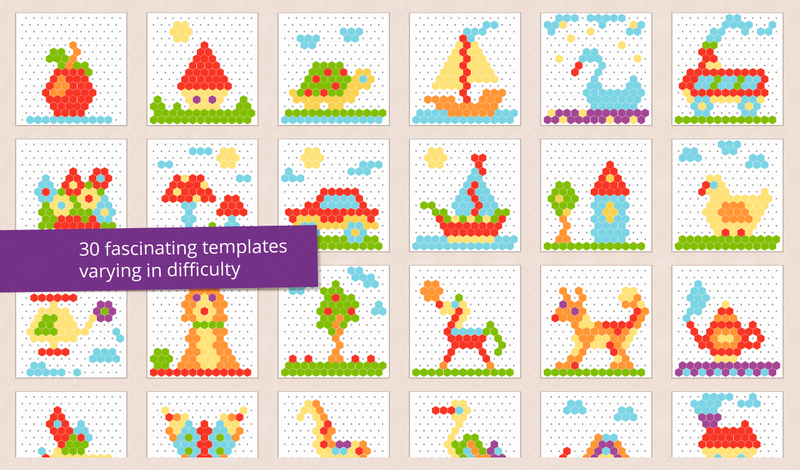 Kids Mosaic is a splendid leisure forchildren, as it improves visual memory, logic, wit and imagination.In the process of playing children learn to distinguish colours andsolve various tasks by creating their own pictures. Besides, makingup unique compositions develops concentration, diligence andattention. 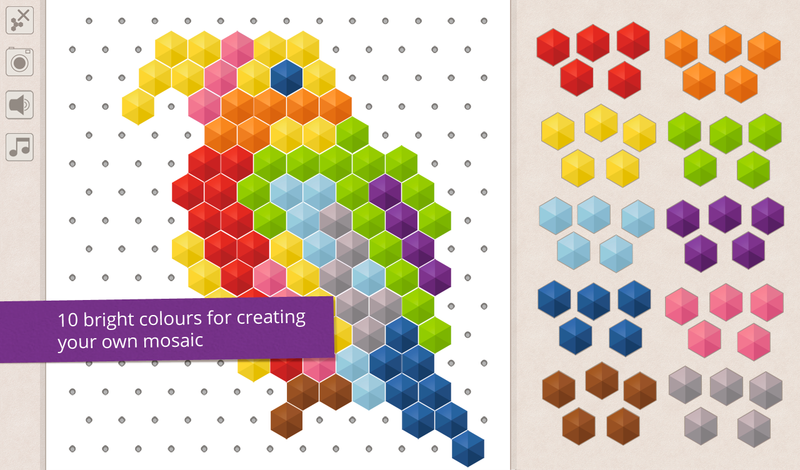 Mosaic is the counterpart of noted plastic mosaic, that’s whatmakes it easy to play but nevertheless entertaining. The game provides two playmodes: Choose mosaic, i.e. making apicture according to one of 30 fascinating templates varying indifficulty and colour diversity, and Free mode, a challenge whichstimulates imagination as it allows to create a unique mosaic usingelements of 10 bright colours. 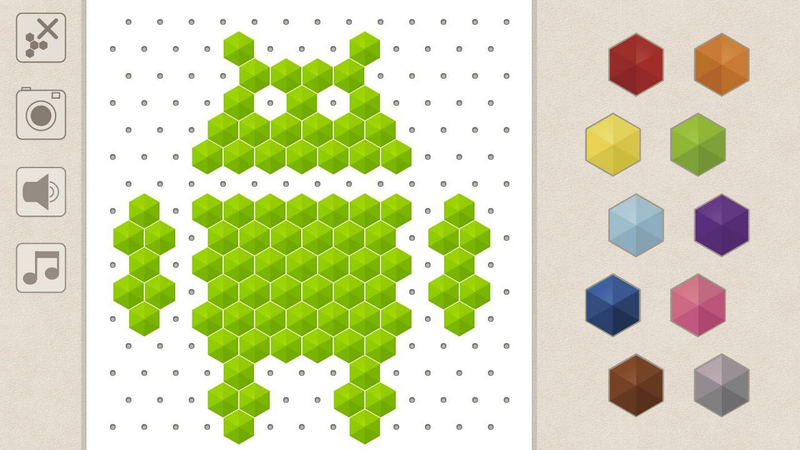 Each complete mosaic can be saved as an image on your gadget. 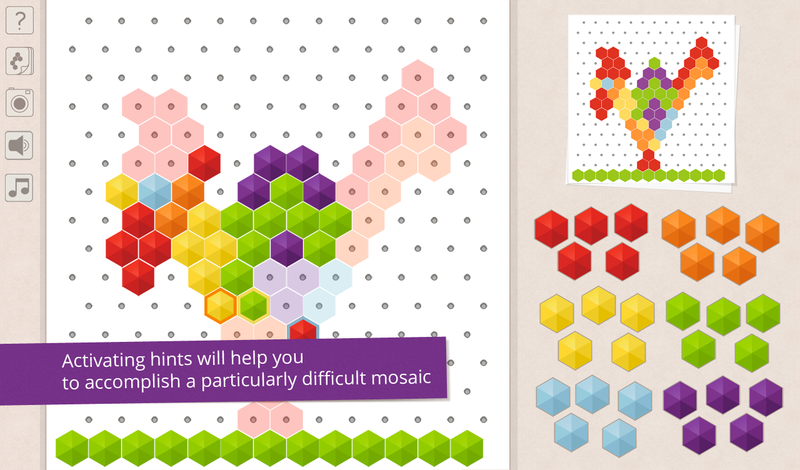 Mosaic makes games both entertaining and educational. Keywords: mosaic, for kids, puzzles, games for children 4 +,children's games, puzzles, children's apps, games for kids,educational games, puzzle for the kids, one word puzzle, logic forkids from 3 years. 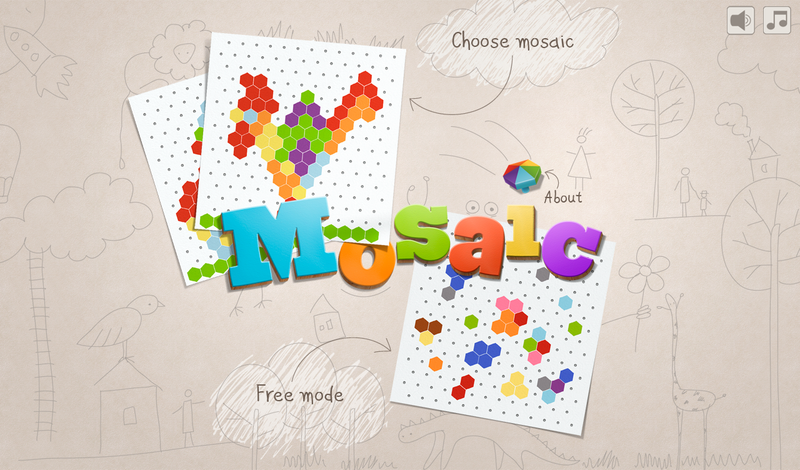 Kids Mosaic is a splendid leisure forchildren, as it improves visual memory, logic, wit and imagination.In the process of playing children learn to distinguish colours andsolve various tasks by creating their own pictures. Besides, makingup unique compositions develops concentration, diligence andattention.Mosaic is the counterpart of noted plastic mosaic, that’s whatmakes it easy to play but nevertheless entertaining.The game provides two playmodes: Choose mosaic, i.e. making apicture according to one of 30 fascinating templates varying indifficulty and colour diversity, and Free mode, a challenge whichstimulates imagination as it allows to create a unique mosaic usingelements of 10 bright colours.Each complete mosaic can be saved as an image on your gadget.Mosaic makes games both entertaining and educational.All templates and Free mode are available in full version of theapp -http://play.google.com/store/apps/details?id=com.topfloat.mosaicKeywords: mosaic, for kids, puzzles, games for children 4 +,children's games, puzzles, children's apps, games for kids,educational games, puzzle for the kids, one word puzzle, logic forkids from 3 years. Are you tired of ordinary painting apps,drawing apps and coloring books? 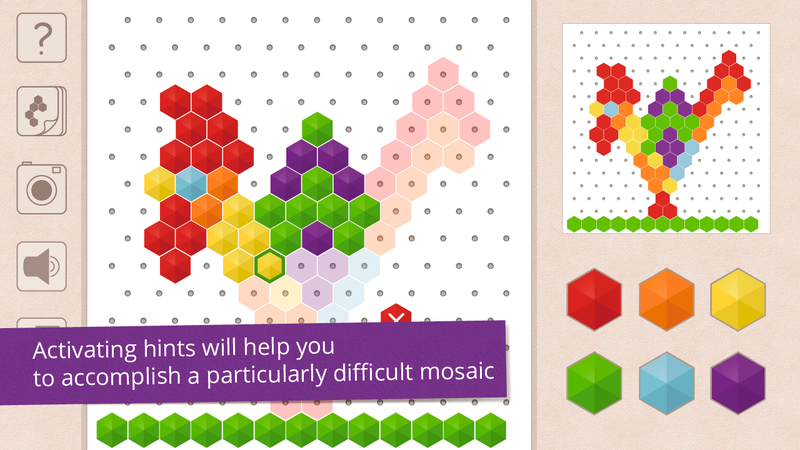 Mosaic is an application that willhelp expand the imagination of young and adult artists alike. 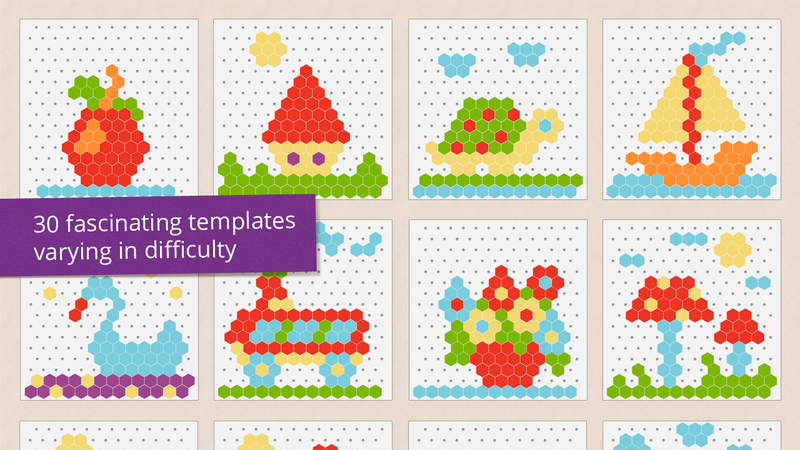 Byusing different shapes and colours, you can create your own uniquemosaic-like images, from simple "flowers" to complex landscapes.Try it out today. Export your work (it will be saved in your PhotoGallery next to your Camera Photos) and share with others.Mosaic App is a creative painting app for all ages. 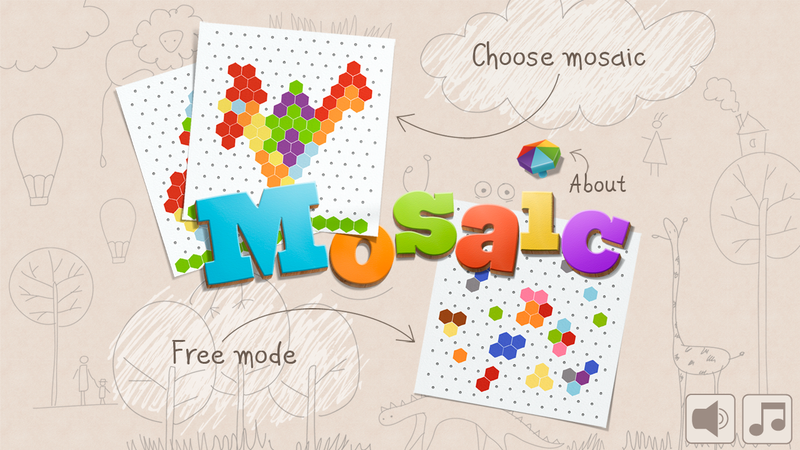 Whether itsfor your kids or for you everyone will enjoy drawing something inMosaic App. 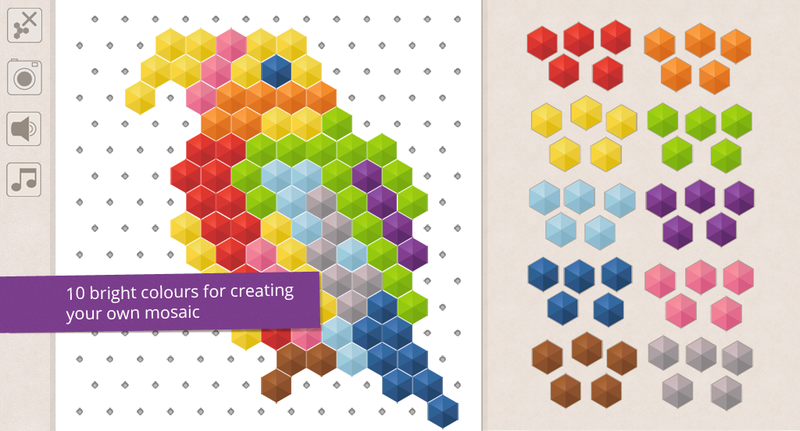 Thanks to various shapes available (triangles, squares,circrles), zoom and undo features you can create anything yourcreative mind can think of. You will be surprised how many creativeideas hide behind a simple blank mosaic. 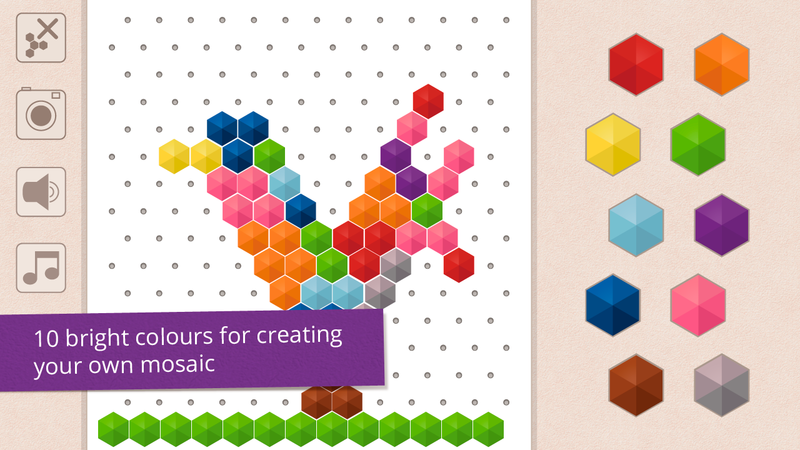 Using various colors oftiles (also called tessera) you can easily create great art.Have fun with this free painting app. And if you really like itdo not hesitate to purchase ads removal add-on available as anin-app purchase. Simple roulette application. No limit for the items size.You canset different weight for the item. [FEATURES] - Different weight forthe item- No limit for the item size.- Click view to reset thebackground. Let your toddler develop their love of music. Your child or toddlerwill love this piano game. This kids piano app has adorableanimations, HD illustrations and sound. When your children touchesscreen, the program activates animations and vibration to stimulatechildren's curiosity. Play piano sounds on the Kids Piano app forfun. Baby Piano offers great fun that keeps your kid entertained,while your kid is learning to enjoy and explore music. Kids pianoapp support big screen and also small screen and also multitouch.This kids piano app is kids game friend, kids music teacher andalso it is a mother's helper to keep children quiet. Kids Piano appis kids favorite. Entertainment with colorful piano while learningpiano sounds. Watch your favorite videos, TV series and programs on the move withMozaic GO. Whenever you want and wherever you are in Qatar you cannow enjoy unlimited video streaming from Mozaic On Demand Clubslibrary.This application and service is free of charge for any NextGeneration Mozaic TV subscribers. You need to subscribe to theparticular Clubs on the Next Generation Mozaic TV to be able towatch the content. How to login to Mozaic GOUse your Mozaic TVAccount Number and the Account PIN to login to Mozaic GO. You canfind this number on your main Mozaic TV service by following thesesteps: 1. Press Set on your remote control2. Select SystemInformation3. Select STB Information. Another way of getting thesedetails; you can call Ooredoo help line, 111, to find out yourMozaic TV Account Number and the Account PINNote:• You need tosubscribe to Next Generation Mozaic TV service to be able to accessMozaic GO app.• You need to subscribe to any of the Mozaic OnDemand Clubs to watch the content on Mozaic GO• Mozaic GO can beused on maximum of 3 devices simultaneously • Mozaic GO works bestwith devices running Android 4.3 and “Data” APNFAQ• Mozaic GO shows‘You have reached the maximum number of connected devices” o Logout from the device that is currently connected to Mozaic GO. To dothis, hold the home button, scroll to Mozaic GO, then swipe rightMozaic GO. This will terminate the session immediately. Go to yourother device and enter your Next Generation Mozaic TV accountnumber.• I can not login o You need the Next Generation Mozaic TVaccount number to log in. This number can be found by navigatingthe Account screen on your TV menu or Ooredoo Help Line, 111.•Mozaic GO kept crashing. o Please log out from the application andreset your device. Launch the application and login. A dazzling, extremely-entertaining, super-fun FREE game fortoddlers and kindergarten children: 1. Blow soap bubble balloons:hearts, stars or even animal shapes, it's your call :) You can alsopop the bubbles with a single tap for even more fun. Pop! Pop! Pop!2. Pump silly animal balloons with your finger, watch them go upinto the air and bounce of each other. Have fun by dragging theballoon animals around, but watch out for the little hedgehog &don't let it fool you with it's cuteness, it can be very dangerousand pop your balloon :) 3. Spin the colorful Pinwheel as fast asyou can first and then switch between different shapes and colorsfor additional crazy care-free pinwheel fun. 4. No need to wait forspring, blow up the dandelion in any time of the year and see theseeds float in the air, a true meadow right inside your house. 5.Play with the puffer fishes swimming in the water, touch them toblow them up and watch them make silly faces while they huff &puff the air out :) 6. Happy Birthday! The sweet Chihuahua dog,silly rabbit and funny duckling need your help to blow out thecandles on their birthday cake. Touch to Huff & Puff and afteryou're done, pop some colorful balloons for even more fun. 7. Whathappens when you give a glass of juice and drinking straw to thechildren? They make bubbles right. Just sit back and relax on thebeach, you'll be served with colorful juices along with some fruitsthat will jump around as you blow air into the straw and createbubbles :) 8. Let's make some noise kids and get ready to party!Grab a funny animal shaped party horn and blow air into it to hearthe funniest sounds of the animated elephant, crocodile or theduck. This game will make your baby feel like they're outdoor inthe summer. They will be enchanted with cute animations and happysongs while playing and developing multiple skills. Whether theyare in the bus, or in doctor's office, or impatiently waiting whileyou are dressing up, or simply wanting to pass time in the houseand get back to their memories of some blowing activity, thissimple app will amaze them. Privacy Disclosure: As parentsourselves, iAbuzz takes children's wellness and privacy veryseriously. Our app: • Does not collect personal data • Does notcontain link to Social Media. Feedback Please: If you have anyfeedback and suggestions on how we could further improve the designand interaction of our apps and games, please visit our websitehttp://iabuzz.com/ or leave us a message at [email protected] Wewould be glad to hear from you as we are committed to update all ofour apps and games on a regular basis with new features and alsowant to get some ideas for future app development. *** We are Coloring App with over 3,000,000 users! *** It's theplace where you get all the beautiful illustrations,includingmandala,zen and animals, along with unlimited choices of colors! Amind journey which makes you anxiety free and stress relieving!Explore the secret garden created in beautifully detailedillustrations and drawings and bring them to life using thosecolorful palettes with your imagination. Have fun in this relaxingpainting experience, refill the energy and let anxiety fade awaythrough coloring games. 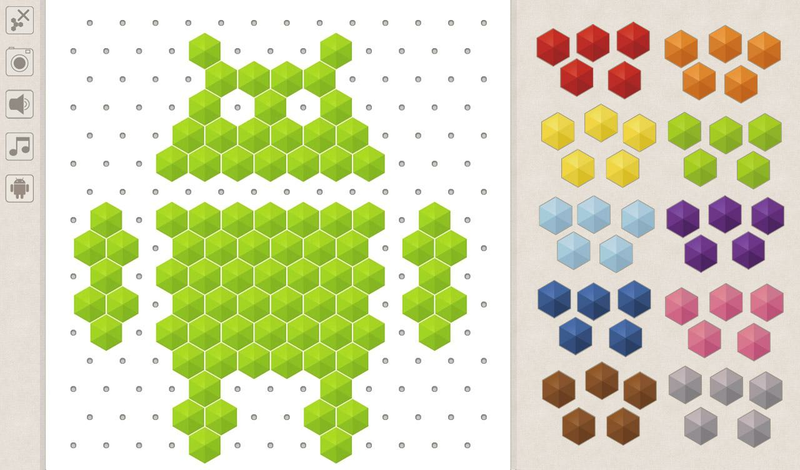 ★ Simply tap to pick color and paint, allyou need is your imagination! ★ Lots of beautiful pages to color,and download new pages from Online Galleries every day! ★Personalized color palettes, pick your favorite! ★ Easy to saveyour work and share them with all your friends, whenever andhowever you like it! ★ Unique infinite filter, enjoy the magic ofhues and bring your creativity to life. 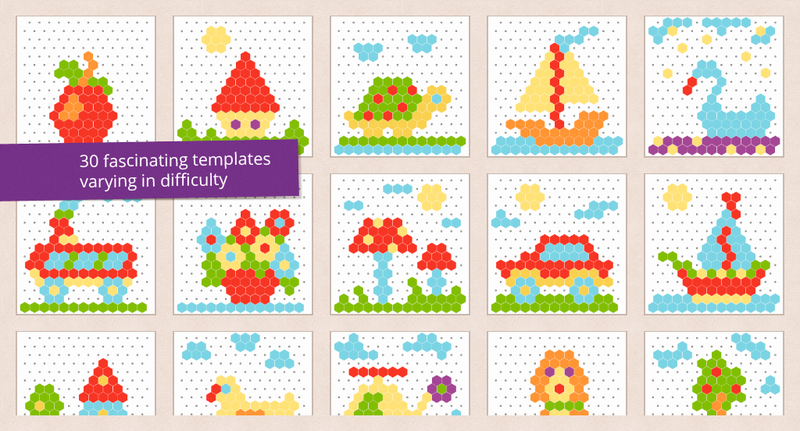 ★ Create your own designs!Import your drawings or take a picture to color them up. ★ Meetyour 3,000,000+ fellow artists worldwide in SHOWROOM and exchangehearts. It's the only one color therapy game you will ever want!Don’t miss this wonderful coloring games, DOWNLOAD NOW! Have you ever been frustrated how unfair dice could be? How manygames have you lost because of this?This app will bring equity andfairness in your games!With Board Game Dice Roller all your dicerolls will be judged by fair random.Currently supported games:Backgammon, Monopoly, Munchkin, Formula D, Settlers of Catan (+Cities & Knights expansion), Stone Age, Merchants &Marauders, Dice Poker (Yatzy), Evolution (+ Continentsexpansion).Includes Small apps extension for Sony products.